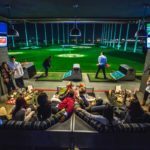 Indoor golf simulators are rapidly growing in popularity, which is not surprising given how much they can add to a player’s golf game. Using these can help you to get in effective practice without having to get out on the course, and as a result they can legitimately help you to become a better player. The specific details of a golf simulator vary between products, but the overarching process remains very much consistent. They consist of a swing pad, from where you hit your shot, and a projection screen, which you hit your shot into. With most simulators, you can choose from a variety of courses which are then projected onto this screen. Once you hit your shot, a huge amount of information is processed in a very short period of time. In general, golf simulators process this information through a range of different motion tracking devices around the edge of the projection screen, including light sensors, radars, and sometimes infrared beams. All of these devices enable the system to gather a great deal of data about your shot. This data is then sent to a computer, which is connected to the projection screen. The computer is able to process all of this data and turn it into analysis, using information about the speed, angle, spin, and power of your shot (to name a few) to create a holistic picture of your shot. The increasing demand for golf simulators means there is inevitably an increasing supply. There are a huge range of options on the market, and the differences between machines can be significant. At the low end, you’ll be able to find golf simulators for just a few hundred dollars. Of course, these don’t generally offer as in-depth an analysis as the more expensive options, and can at times lose out on accuracy, but there are certainly some decent options at the lower end of the price scale. Conversely, those with a few extra thousand dollars lying around can find extremely detailed, accurate, high-quality golf simulators. The best of these can cost up to $70,000 or more – obviously a reasonably significant chunk of money – but are generally incredibly high-tech systems. Below, we’ve reviewed three different golf simulators from all ends of the price scale, as well as a couple of other handy systems which can benefit your game, to give you a comprehensive idea of the various options available. The OptiShot 2 Golf Simulator is right at the lower end of the scale. This will cost just a few hundred dollars, so for those with a relatively small budget it can be a great option. This simulator is able to send information to Mac’s and PC’s, meaning you can store the information on your own computer. The problems which inevitably arise with cheaper simulators is the level of accuracy they offer, and OptiShot has not been spared this criticism. 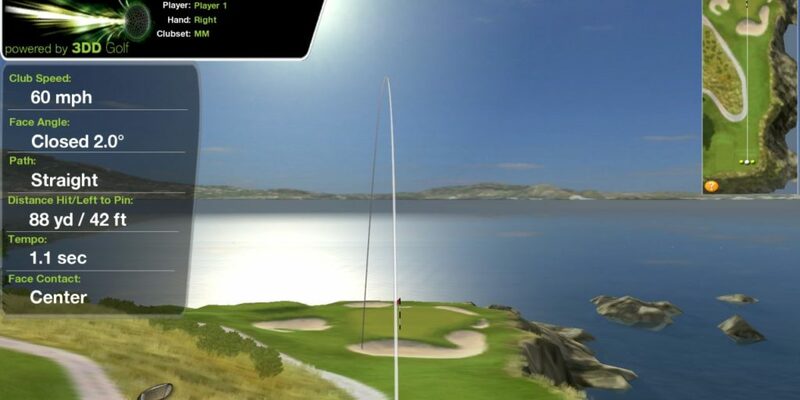 Many users feel that it doesn’t always offer a realistic representation of your shot, and the putting in particular – a problem with many simulators – is generally viewed as particularly inaccurate. Having said that, a majority of users feel that most of the time the OptiShot provides an accurate and detailed overview of your shot, far more so than many more expensive products. 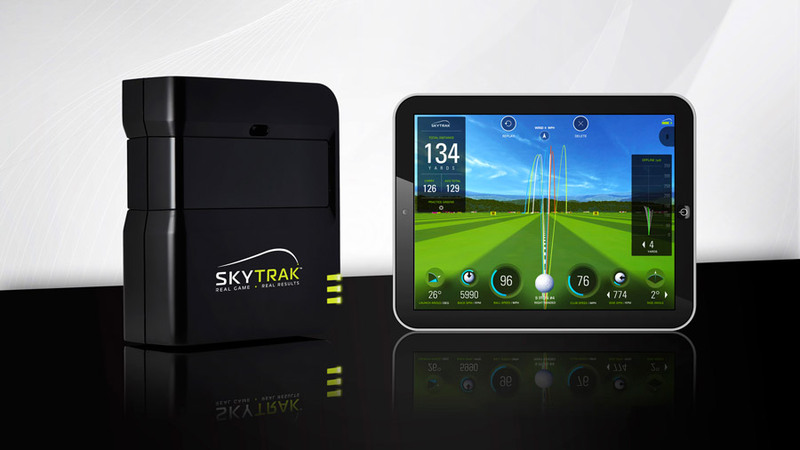 SkyTrak advertizes itself as the ultimate middle end product, able to replicate the highest end golf simulators while coming in at just a fraction of the price. Though it doesn’t offer the detail available with the best of the best, it is a high quality simulator which is affordable for many players. The product will cost you a couple of thousand dollars, but SkyTrak offer the option of paying it off for as little as $60 per month. 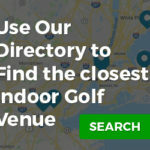 It offers hundreds of world famous golf courses for you to play, and is generally regarded by users as very accurate. An added feature is that, as well as being compatible with PC, it also works with iOS and Android, so you can view all the data it provides on your phone or tablet. Full Swing Golf have created a range of extremely high-end golf simulators, simulators used by some of the top golfers on the planet. They use innovative infrared patented dual tracking technology for a more accurate system, and provides users with the opportunity to play some of the best courses in the world in high quality graphics. They offer a ‘sport’ series and a ‘pro’ series, each of which has three different options of various costs. Products from the sport series start at $21,900, while the pro series products will cost you a minimum of $34,900. They also offer a virtual green for $30,000. While this is certainly a lot to pay for something which will only allow you to work on your putting, it is a high quality product which eliminates the problem many simulators have with putting. Rukket’s 3 piece golf bundle differs from the other products mentioned in this list in that it isn’t a golf simulator. It does, however, still allow you to practice your long game in an effective way. 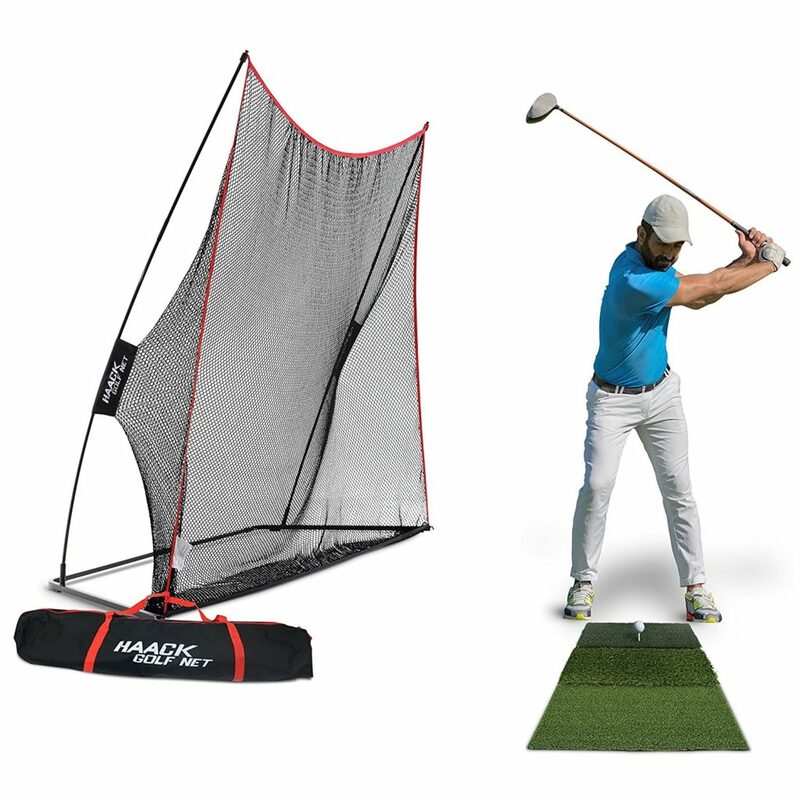 Included in this bundle is a turf golf mat and a golf net, which can be easily setup and used within just a couple of minutes. 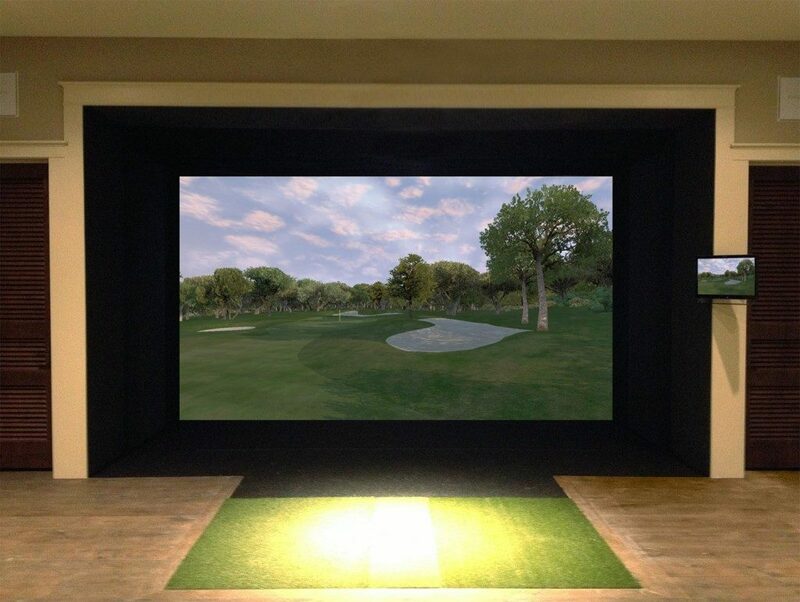 This may not be a golf simulator as such, but it can still have a significant positive impact on your game. While you won’t get the ability to see exactly where your ball would have ended up, it does allow you to quickly and easily practice your swing from the comfort of your own home. On top of that, it’s cheaper than virtually every golf simulator on the market, so for those who don’t necessarily want all the bells and whistles of one of those more expensive products, this can be a great option. Again, this product is not a golf simulator per-se, but is still worth including in this list for the benefits it can provide to your golf game. A recurring theme of simulators is that the putting element is not particularly well developed. This putting green has no such problems, and allows you to work on arguably the most important skill in golf without having to head out to the course. The Putt-A-Bout is a relatively simple product. 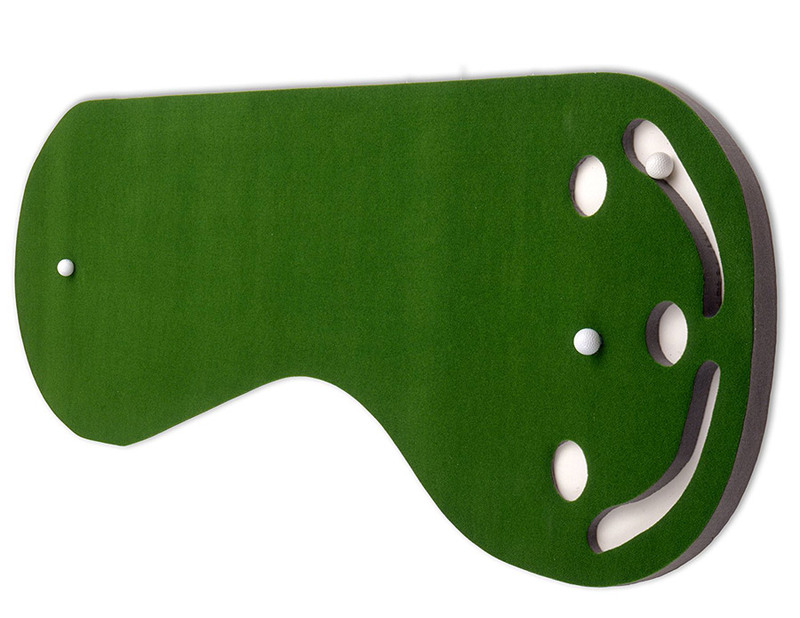 Measuring nine feet long, it is a kidney shaped green made out of PET resin. It has three holes to aim at, and mini sand traps behind the holes to ensure your ball doesn’t roll away when you miss. It is a far more simplistic product than the others in this list, but as a result it will cost you less than $50 and can still have a significant impact on your game. 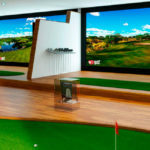 How to create your own custom-made golf simulator? One thing you may have noticed from reading about golf simulators is that they all have a few important pieces. Basically, they need a mat to hit off, a net to hit into, a projector, a simulator to collect information, and a computer to analyze it. The golf simulators mentioned above, as well as most alternatives, offer all of these within a single package. What if, however, you want a simulator created out of different parts of different simulators? Perhaps you like the projector screen and the mat of one product, but think the analysis offered by the simulator machine of another is superior. Fortunately, each of the five elements required to create a functioning golf simulator can be purchased separately if you so desire. You can buy mats, projectors and nets from a variety of places, and can pay according to how much durability and quality you need each of these components to possess. In terms of a computer, many people will already have one which is capable of running the software needed, which just leaves the simulator itself. This is obviously the most important piece of the puzzle, and which one is best for your depends on your individual needs. Overall, this is a feasible option and one which many people opt for. It allows you to pick and choose the various parts of your golf simulator to create a unique system which best suits you. Of course, it does require a little extra research, which for many people won’t be worth it. Regardless, whether you choose to create your own custom-made golf simulator or purchase one of the many options available on the market, there’s a good chance it will benefit your game. These products are a great addition to the golf industry, making it possible for golf lovers to enjoy the game more often and improve their play. Whether you’re a casual player who wants to spend a little more time practicing, or someone who is willing to spend large sums of money for a high-quality system, the list above shows that there is an option out there for you.